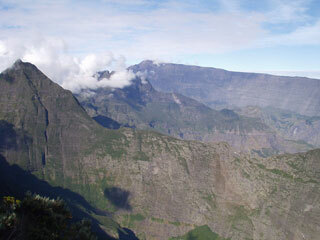 The Pitons, cirques and remparts of Reunion Island site coincides with the core zone of La Réunion National Park. The property covers more than 100,000 ha or 40 % of La Réunion, an island comprising two adjoining volcanic massifs located in the south-west of the Indian Ocean. Dominated by two towering volcanic peaks, massive walls and three cliff-rimmed cirques, the property includes a great variety of rugged terrain and impressive escarpments, forested gorges and basins creating a visually striking landscape. It is the natural habitat for a wide diversity of plants, presenting a high level of endemism. There are subtropical rainforests, cloud forests and heaths creating a remarkable and visually appealing mosaic of ecosystems and landscape features. This article uses material from UNESCO World Heritage List article "Réunion National Park", which is released under the Creative Commons Attribution-Share-Alike 3.0 IGO License.